The concern about having a quality computer to play new PC games is far beyond a robust CPU. The concern when buying new components should also be on choosing the right monitor for games. Therefore, we gathered tips to help you understand what the most appropriate monitor for you. Despite the question seem more common for those who are looking for a TV, the question should also be taken to clean the purchase of a monitor. The main difference between them is the contrast and color quality difference. The LCD screen, which is usually cheaper, is indicated for games that are very colorful. Have LED technology, despite being a little more expensive, is more suitable for dark and gloomy games. This is because LEDs have screens around the screen by improving the tone and color reproduction and, therefore, enhance the contrast. The response time is as a monitor takes to play back an image. If it is delayed, the game may be impaired. For example, if your character is taking a shot, but the monitor does not play, you can lose a game and not even know it. The high rates may be responsible, too, blurs and ghosts in the game. The time is measured from the milliseconds that a pixel "totally black" to travel to the "pure white" and then back to black. The smaller the number, the better. Preference is to be below 2ms. This rate is the "best friend" response time. That is, the two factors work together to have high quality in the game. It is the refresh rate that shows the device's ability to update the on-screen information. The higher the number, the faster will be delivered by the monitor. Thus, there is more clarity and fluency, especially in scenes where many things happen. When the refresh rate is not enough, place two common mistakes in games: tear (when two scenes are displayed at the same time) or delay. The most common is to find monitors with a rate of 60 Hz, which in most cases is enough for the images to be delivered in the right way. Monitors should meet high graphics technology of the games. Exactly so it is important to pay attention in the resolution of the component. It is this question that measures the number of pixels that the monitor displays on the screen. More simply, the images have more details when the numbers are higher. Therefore, the most recommended for a gamer is a monitor that has quality FullHD (1920 × 1080). Still thinking of the resolutions, a major news for enthusiasts is the ability to play on a 4K monitor. It has a resolution four times greater than the FULLHD. Only this information fills the eyes of many people. But is it really worth investing in it? Despite the high resolution technology, most monitors have 30Hz response time, half of the recommended to play. Moreover, among those offering 60 Hz, the specifications say that to do this we must play in FullHD. Thus, it might be better to rethink investing more - monitors are more expensive than ordinary - and expect new specifications. Not much talked about, is this factor that is driving will be like lighting a match. In practice, the static contrast which shows the actual rate contrast of a display - a comparison between white and black light. While thinking of huge screens is the most common, is not always the best and the greatest option. This is because the screen size goes along with the space where it will be. That is, a giant screen in a space where you will be "stuck" on the monitor, can disturb the game instead of helping. 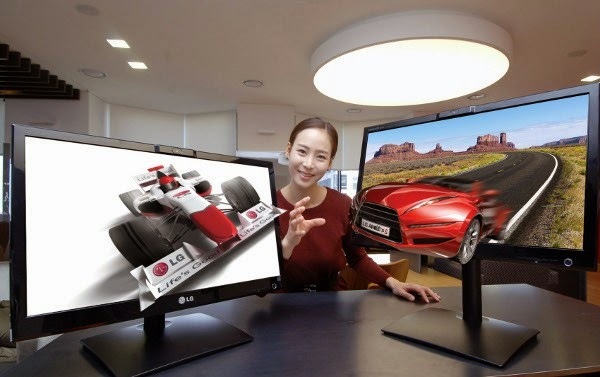 To get a better sense, the average size of most monitors are sold between 19 and 24 inches. Increasingly the games industry presents new games with 3D option. If you want an even greater immersion in your game, keep in mind a few points to purchase the correct monitor. The first is the refresh rate. Instead of 60 Hz, you should have at least 120 Hz. The explanation is simple: as the picture needs to be generated twice, the monitor must be able to divide the two images at 60 Hz each. Also, keep in mind that your video card must be compatible with 3D technology. There is no point having a super monitor if your video card does not meet the height. Different brands offer specific components to games. It is also important to always be with the updated drivers. The high demand for monitors that have specifications for games made large companies cast them into specific screens for players. In them are embedded technologies that help the user experience. BenQ, for example, has technologies to improve the fast moving and improve focus on shooters, and promising better refresh rates and adjust brightness levels not to cause discomfort after many hours of play. Already Nvidia brings a technology that makes the monitor to talk to the GPU in a new way, drastically minimizing delays and locked images.